Allen Fitzsimmons of Belchertown, MA, is the owner of Talon Furniture Gallery and chief executive officer of Transitioning Forward, an organization specializing in asset appraisal and other aspects of estate settlements. When he is not working, Allen Fitzsimmons enjoys playing tennis. He has played competitively and has spent a decade as a certified teaching pro. In 2014, German Sabine Lisicki set the all-time record for fastest serve in a women’s tennis match. Competing against Ana Ivanovic at the Bank of the West Classic in Stanford, Lisicki struck a 131-mile-per-hour serve, besting the previous record, set by Venus Williams seven years earlier, by 2 miles per hour. Ivanovic got a racket on the ball, preventing Lisicki from hitting an outright ace, but could not return the serve. However, the 2008 French Open champion ultimately prevailed over the new world record holder by a score of 7-6, 6-1. Other female record holders include Serena Williams at 128.6 miles per hour, Julia Gorges at 126.1, and Brenda Schultz-McCarthy at 126. 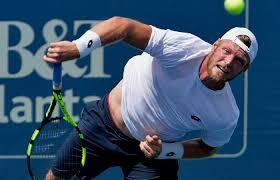 On the men’s side, the record for fastest serve belongs to Sam Groth of Australia. Groth set the all-time service speed record at a challenger event in Busan, with a delivery clocking in at 163.7 miles per hour. It should be noted that the Australian’s impressive serve is not officially recognized by the Association of Tennis Professionals (ATP), which attributes the record to a 157-mile-per-hour serve by American John Isner. Isner set the record in a four-set Davis Cup match against Bernard Tomic in which he recorded 49 aces and no double faults. The CEO of Transitioning Forward in Belchertown, MA, Allen Fitzsimmons earned a master of science in management from Simon Business School and a bachelor of arts in economics and political science from the University of Rochester (UR). While attending UR, he joined the varsity tennis team. Today, Allen Fitzsimmons holds current USPTA (United States Professional Tennis Association) certification, teaching other players and competing at the tournament level. The USPTA provides official certification in the United States and more than 80 foreign countries. To qualify for certified USPTA membership, individuals must pass an application/exam process, meet relevant tennis experience requirements, agree to abide by the USPTA Code of Ethics, and generate or plan to generate a major portion of personal income from tennis instruction. In addition to a general “professional” designation, the USPTA offers both “elite professional” and “master professional” designations, which are more difficult to obtain and carry greater esteem. The organization also offers specialized certification in areas that range from school coaching to wheelchair play. Allen Fitzsimmons, owner of Transitioning Forward, is interested in helping people move easily through life transitions. Allen Fitzsimmons, of Belchertown, MA, is an avid tennis player in the USTA. The United States Tennis Association works with returning military to help with the transition from military life to civilian life. There are approximately 22.7 million military veterans in the United States. USTA Foundation’s Military Outreach includes introducing tennis to wounded warriors as a form of physical rehabilitation. The Wounded Warrior tennis training offered by the USTA encourages returning military personnel to reconnect with other military veterans in sportsmanship, brotherhood, and competition. For some of the returning military members, this is an opportunity to engage in physical activity in a non-judgmental setting with other military personnel, active and retired. For other players, it is a chance to improve their lives and connect with their families. Sports can give veterans focus and a way to return to a more normal civilian life. The US Tennis Association’s goals with physical therapy are for the military veteran to increase physical activity while decreasing stress and social anxiety. Allen Fitzsimmons is a small business owner and sales professional with experience owning three small businesses. A business operations and marketing expert, he is currently the principal at his company, Transitioning Forward, based in Belchertown, MA. Outside of his work, Allen Fitzsimmons has played tennis competitively for many years and is a USPTA-certified instructor. Including more than 15,000 members, the United States Professional Tennis Association (USPTA) is a professional association for tennis coaches and professionals. The organization was founded in 1927 and seeks to advance the sport of tennis as well as raise the standards of its members. The association also provides a number of different certifications for professions in tennis. One such certification offered is the USPTA’s recreational coach certification. Designed for individuals who are coaching tennis part-time, such as coaches at schools or recreational facilities, the accreditation ensures that coaches remain current on the standards of the USPTA. Requirements to be a recreational coach include attending in-person USPTA workshops or taking the Professional Tennis Coaches Academy I online to learn the basic teaching standards for the sport.